This one is very appealing to me too! Your recipes always look so great! This has to be amazing with fresh cilantro on top! oh wow! 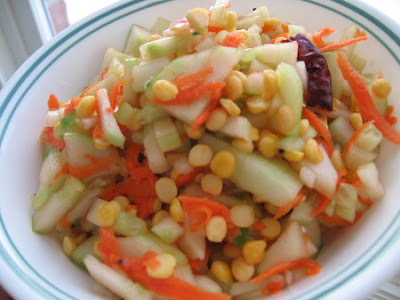 I have had this salad with moong dhal..I have to try this one! Sounds yummy, I love chana dal.... and so healthy for you! That looks so good. Yum. nice veggie recipe, the cilantro gives this recipe a wonderful taste! do you have more recipes ?